If you’re one of those people who think video games, and pinball video games in particular, are hellspawn that need to be killed with fire, then I suggest you look away now. For everyone else, Cannonbolt is a surprisingly fun little distraction, incorporating some cool boss battle features, modes, multi-level tables and a sort of force field like ball saver. Basically, it doesn’t attempt to emulate real pinball but does things that aren’t possible in the real world. The physics, like all flash games, leave something to be desired but feel far more intuitive than most other games I’ve played. Not “real-world”, mind you, but intuitive – similar to how the physics feel intuitive in modern first person shooter games even though they’re not real in the slightest. A big plus for this game is the ability to use Z and ? keys for the flipper buttons. Games which only allow the left and right arrows are basically unplayable by default. 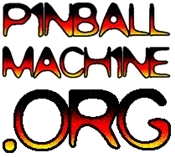 If you know of any other decent online pinball games, let us know!